Every now and then I get in the mood for snackage, but a little gourmet like. Don't get me wrong, I can eat chips and salsa with the best of them (literally, SMHDad is a salsa making fool), but I also like snacks that are a little more ... complex. Now, for some reason, I usually have my best inspiration when transforming a prepared or left over ingredient. My most recent snack creation - freshly made bruschetta, was inspired by left over dinner rolls from the previous nights dinner from Bertuccis. 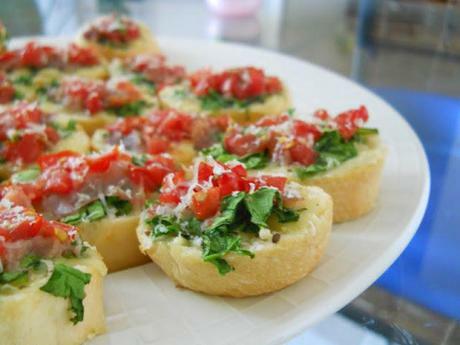 Here's what you'll need: 2 oz finely chopped fresh baby spinach 2 oz finely diced tomatoes 4 oz grated cheese (I used a mix of Dubliner and parmesan) Black pepper 2 oz finely chopped prosciutto 3 - 4 dinner rolls (or 1 mini baguette) Preheat oven to 350 degrees. Cut bread evenly in medium sized slices. Lay bread slices out on a cookie tray Layer cheese evenly on each slice. Do the same with the spinach and prosciutto. Top with tomatoes and place in oven for approximately 10 minutes or until the cheese has melted. Remove from oven and lightly top with cracked pepper and grated parmesan cheese. Let cool for like 2 seconds - that's as long as you can reasonably allow yourself to wait before devouring. You're welcome. The Nokia 900 Smartphone - Does It Make Your Wish List?